In the early 1990s our newly built Ewood Park was full, the team were flying and the cry from the opposition fans was always about where we were before all of this. Or as a West Ham fan sung on the tube in 1995 - "that shirt, looks awfully new." To this day, some fans of other Lancashire clubs refer to Blackburn Rovers as "plastics" - a fan base that is younger, more middle class, glory hunting and yes, female. 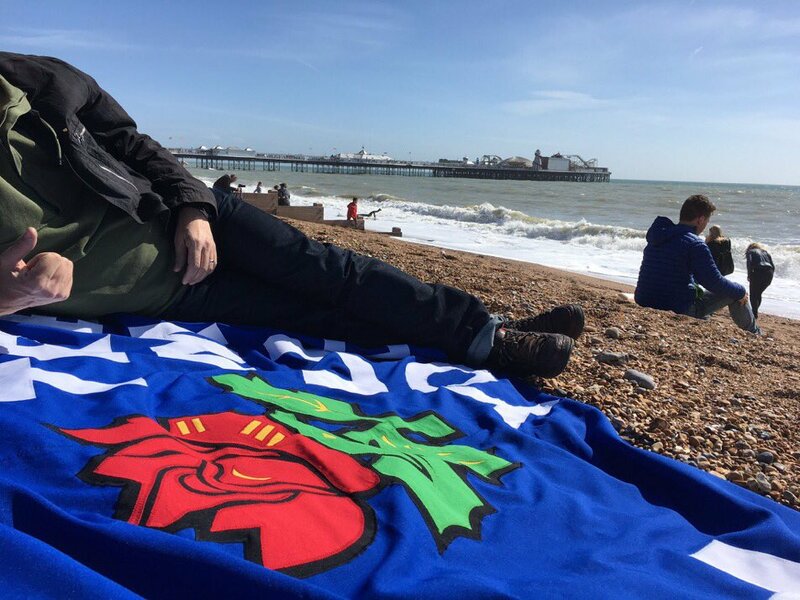 Our trip to Brighton yesterday reminded me of that. I genuinely don't think I've ever been part of such a civilised, gentrified and polite football crowd. Maybe it was the sunshine or the success of the local team, but actually I think it's the onward success of a club with potential in a prosperous area, something that you'd struggle to attribute to Blackburn. Even the Rovers fans seemed mostly to be marketing managers and investment directors, originally from the Ribble Valley, on a day trip from the London suburbs to see their home town club. The Amex Community Stadium is one of the most impressive of the new builds. The stand the TV cameras are in - which you don't see on TV - is enormous, similar in shape and tiers to the Etihad. The quality of the seats even in our little away fans corner were of highly superior cushioning. The local train service was convenient, quick and well organised, and without wishing to mix two obsessions on one day, the Southern Railways trains are in a different league to what we suffer on Northern Rail. The pre-match build up was more like that for a community arts festival than a Championship football match. A little contrived, but at least the brass band rendition of Sussex by the Sea is more fitting for them than a limp Coldplay effort which we endured for two seasons. Every club has their own way of piping in rousing music, something I could frankly do without at my vintage. What it didn't do was make it a cauldron of hatred. If I'm honest Brighton should slip nicely into the increasingly southern and very shiny Premier League, so they can renew their rivalry with the "stripey Nigels" at Crystal Palace. They won't have problems attracting international talent to come to the south east and they clearly have a coherant and sizeable fan base to fill their stadium. On one other occasion this season we've found ourselves directly across the segregation of the webbed seats from the home supporters. At Huddersfield it was pretty feral and intense. Yesterday, they were practically sharing their hummus dip and discussing the parliamentary performance of Brighton's Green MP Caroline Lucas. One chap at the end applauded us for longer than the Rovers players did. You can read match reports elsewhere, from people who do it for a living, but they will no doubt tell you that we played alright but didn't create enough chances. I thought Emnes should have done better with his chance, Mahoney needs to be more deadly and we probably missed Danny Graham's poaching. Brighton aren't twenty odd places better than Rovers, but they have the luck and the persistence to win games like this. Another new ground chalked off. I make it the 147th ground I've watched football on, I'm still on 82 out of the Punk 92 as I'd seen Brighton at the Goldstone Ground quite a few times, but it is my 72nd of the current 92 and the full sweep of this season's Championship. It was a long day out, but I was also reminded why I do this, what keeps me at it, the memories, the friendships, a little bit of the football and not a little obsession with doing the 92.